I’m very lucky. I’ve spent a lot of time on, or in, the water, both in my work for Whale and Dolphin Conservation (www.whales.org) and as a surfer, on my own search for waves. I’ve travelled all over: France, Barbados, Morocco, Canada and more. But when I came to write books, featuring surfing, and the rescue of stranded whales (in the one I’m writing now), I chose to set them here in the UK and specifically Cornwall. Why? Firstly, I simply know it better. I’ve spent more time patrolling the Cornish coast’s coves and beaches looking for waves, than anywhere else. And especially in autumn and winter, when the storms hit, the waves are bigger and the crowds are thinner. For me, that’s when the place really comes alive. The clichés of winter surfing are all about driving through hard rain, squeezing into cold rubber, and getting battered in heavy swells. In other words, you’d have to be a masochist. Yes, all of the above is part of the experience but there’s plenty of sunny days too, in autumn the water is still warm, and the tech on the wetsuits these days is amazing. You really don’t get that cold. (Honest!). There’s something about getting in the sea in the more remote locations; something about connecting with somewhere that is still a wilderness, but right on our doorstep; something about riding the sort of waves only a serious storm can generate. It’s wild and elemental, different from - and an antidote to - a screen, work and stress filled life. There’s the search too. There are popular spots like Croyde in Devon and Newquay in Cornwall, sure. But I pretty much never surf them. Even in these days of insta-everything, there are places that are secret; that only work in a bigger swell. Places you might have to walk cliffs, climb rocks or paddle a long way to get to. And if you put in the effort, you can be rewarded with top class waves. On their day, the reefs at Porthleven and Lynmouth are amazing. But there are other places too. 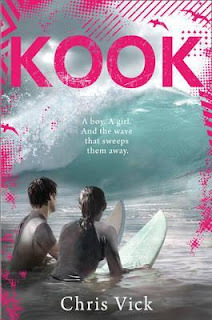 I wanted to get the atmosphere of this’ search’ in Kook. All of which might make you think it’s all just about surf. It’s not. It’s about those places, and also about a bunch of teens finding a challenge, a rite of passage, that they can’t get from an urban life, an x box or on a football pitch. In short, adventure. We can all relate to that. So, a lot of my own experiences of being in home seas, have seeped onto the pages. I’ve even surfed with dolphins here. I’ve seen whales In Mexico from a row boat, dwarfed by the grey whales we were studying. Killer whales in Canada, so close I could see their black marble eyes staring at me. But this was always from the safety of a research boat. It’s different when you’re in the water. I was surfing in Cornwall, down at my favourite spot, a bay of granite rock and azure water when I saw a grey bullet of dolphin, headed straight at me. I wasn’t afraid exactly, but it was unnerving. Male UK Bottlenose dolphins are ten foot long, and they move at speed. It surfaced followed by the arcing backs and exploding phoosh breaths of its pod, or family group. How many were there. Four, five? More? Before I even gasped they were under and around me. They rode a few waves, and made it look easy, swooping and carving, rushing and diving. True aquatic acrobats. Up, down, in and out of the water. Total masters of the same waves, we clumsily, and desperately, work to try and glide on. Just so we can do for a few seconds what they can do any time they please. As far as I could tell, they did it for the same reason we do. The heart thrilling rush of it. Another key experience, influenced the rite of passage for the surfers in Kook; to surf An island, with reefs called the Devil’s Horns. There’s a real place that inspired it. It’s not on any surf website. In these times of instagram, when anyone can take a photo and give a map ref. it’s still a secret spot. It’s a nightmare to get to, it only works at low tide. It needs a massive swell, with particular wave and wind direction, to really get going. Basically, it’s fickle as hell. So its un-crowded. The muddy path runs through thick woods, between steep hills. At the end there’s a slippy clamber down some rocks. There’s a thin entry and exit point, after which, you paddle like crazy to get out and round, into the bay, where you surf in front of the cliffs. Usually, if it’s working at all, it’s big. There’s an ever present danger of rips, taking you away from the entry/exit spot. The waves can close out (break wide and quickly) a lot, not only robbing you of a ride, but threatening to give you a nasty pasting. It only works in a big winter storm. So it’s usually dark, rainy and cold too. But the place offers up a solid mix of quality surf and real adventure. You have to be careful. You back off or paddle over, ten waves for every one you go for. But when you do get one, it’s fast and hollow.